People all over the nation are celebrating the power of writing this week and next. October 20th is the National Day on Writing…and with it falling on a Sunday, there are even more days to celebrate writing. We’ve planned for multiple parts to our celebration of writing…in our classroom, at our school, in our district…and beyond. And with the theme, write2connect, we’ve focused on how writing connects. 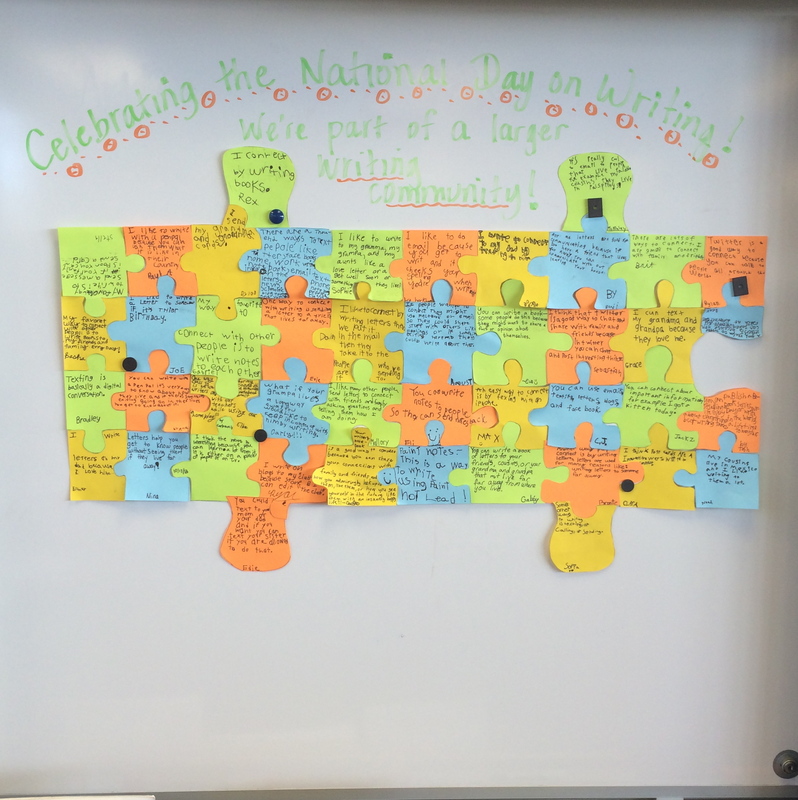 In our district every class has worked to create a puzzle piece highlighting student writing…that interconnects with the other puzzle pieces to create a collage of writing at each school site. For our pieces (we have two since our class has two teachers and twice as many students) each student has a puzzle piece that interconnects to create the larger puzzle piece. In their individual puzzle piece each student answers the question, how does writing connect us? They included answers like writing letters to grandparents, sending emails, writing books and notes, and connecting with teachers in their Homework Writer’s Notebooks. Our school-wide puzzle will be unveiled on Monday…stay tuned! Today we also physically connected with older students at our other school to write together. Nearly 100 students in grades one through five spent the morning playing with writing. Using the Common Core text types as broad categories, they explored writing about the same topic in three different ways. This whirlwind of writing was such fun…and successful. Students wrote an amazing amount–and such variety, they wrote about soccer and horses and books and clubs and so much more. In our last few minutes at the end of our allotted time, a few students read their writing aloud while the others guessed whether the writing was primarily narrative, informational, or opinion in nature. I love watching writers at work! 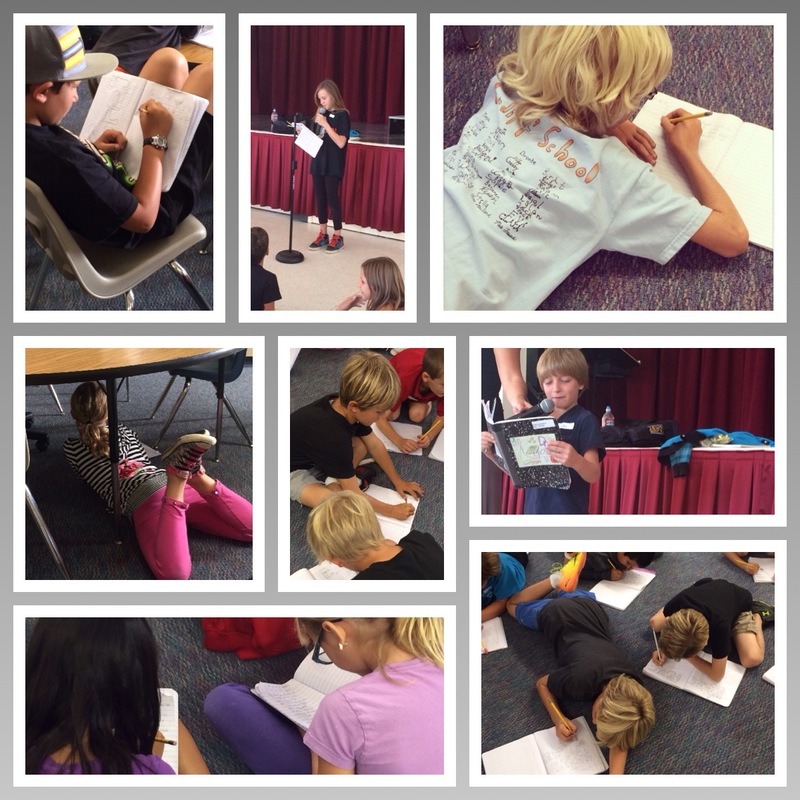 They were so focused and engaged as they scribbled ideas into their writer’s notebooks. They all wrote and wrote and wrote…and we didn’t have nearly enough time to hear all who wanted to share! And we have more in store on Monday! We will be participating in a large-scale “chalk talk” posted in our wall ball courts…and admiring our puzzles of connected writing. We also plan to initiate our class twitter account and share some of the amazing and thoughtful ideas students are writing! Check out the #write2connect hashtag on twitter! How are you celebrating the National Day on Writing? This entry was posted in celebrating, Connected Learning, writing and tagged celebration, chalk talk, National Day on Writing, Puzzle, write2connect, writing on October 18, 2013 by kd0602. We had so much fun creating our puzzle pieces on our site today We too are taking the project into Monday. My classes will be putting our school wide mural together next week and finishing our concrete poetry. We will have to share photos! Can’t wait to see your chalk writing as well. Pingback: National Day on Writing – October 20th | Crow Arrow, Inc.
Pingback: A Writing Kind of Day | Thinking. Writing. Creating.